Noted in-ring boxing emcee Joe Antonacci recently announced he has secured the rights to publish "Joe Palooka," a new incarnation of a character that debuted in 1930, and was discontinued 54 years later, in 1984. "I grew up reading 'Joe Palooka,' and I remember the excitement I experienced as I anticipated each new comic coming out," Antonacci stated in an official release. "I want kids and teenagers today to experience that same feeling. And I believe 'Joe Palooka' as an MMA fighter is the way to accomplish that. "The Joe Palooka we are introducing is totally new. 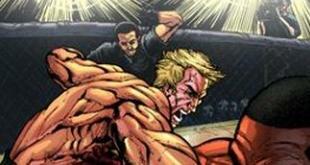 He will tell comic book and MMA fans the true story of how amazing this new breed of athletes are. The character will face ups and downs as well as personal and professional challenges. Our readers will get to know the real life fighters they follow in magazines, and on TV, by experiencing MMA from the inside." "The launch of these series presents a truly unique opportunity to MMA fans. We're breaking new ground here, but I expect the fight community will love the product and respond in kind. I'm excited to see the heights that 'Joe Palooka' and 'Legion of Combat' will reach."